It's hard to remember a time when I was this completely captured by a game. It's not exactly revolutionary by any means, it's a game where the sum of all things just comes together in such a way that it's so entertaining to play. 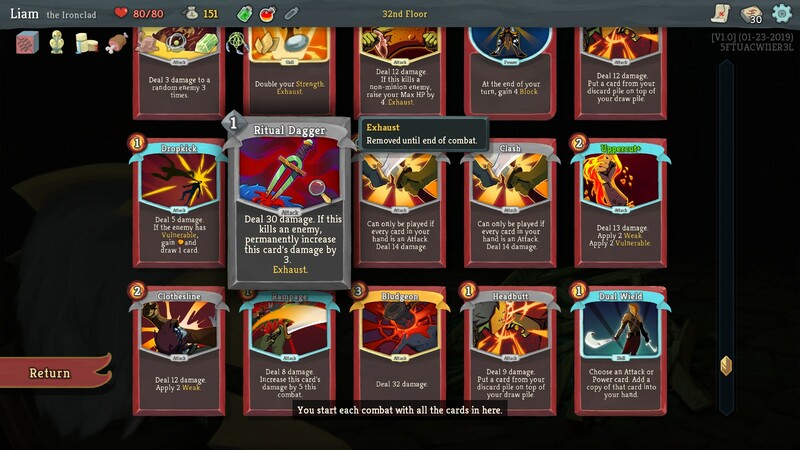 The mixture of card-based combat, mixed together with the Relic system really does make it constantly interesting and every single run feels different. You quickly build up a vast array of these Relics, each having a completely different effect on you and your enemies. Some might reduce enemies down to 1 HP, some may give you more energy to play cards every few turns or even revive you on death. The variety to them is quite amazing! Each time you start a new run, you're asked to make a decision right away. The options you're given are always interesting too. 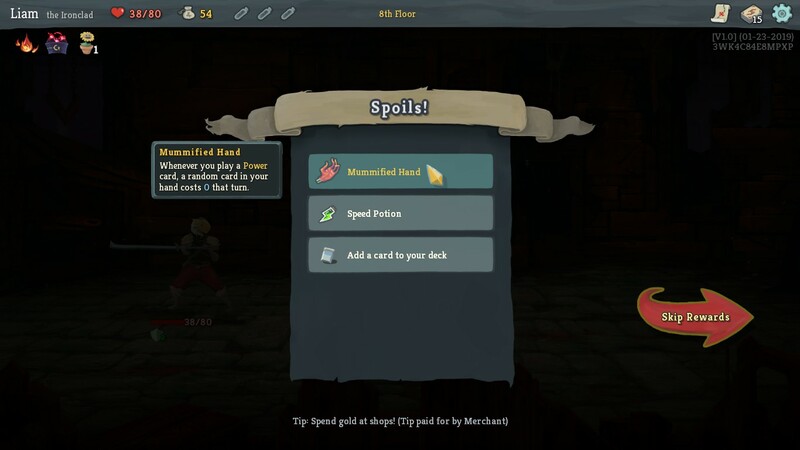 Do you lose all your gold for a rare card, do you lose your initial Relic for a Boss Relic and so on. Decisions, decisions. It's not just the captivating gameplay, it's also the brilliant design work that went into the cards themselves and all the creatures you come across. I'm such a huge fan of the clever way they use animations, wobbly text and all sorts together to form such a unique experience. Due to the random nature of the game, it will absolutely infuriate you at times. Some of it might even feel downright unfair, however, I've found there's almost always a way out of a messy battle as long as you play your cards right. That's the key, using your cards in the right order and combination. What might at first seem like a battle that will be a complete loss, can be completely turned around simply by playing specific cards at the right time. 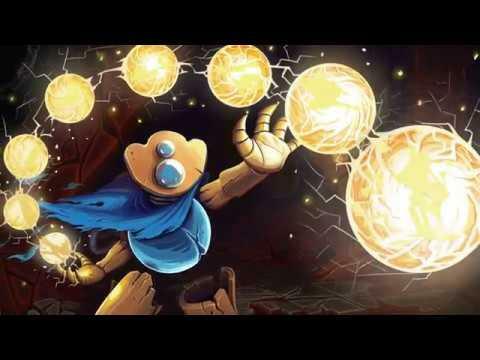 Not everything in Slay the Spire is just about combat though, that's probably one of the big reasons why I've enjoyed it. You also get to camp a few times, deciding between powering up a specific card or healing some lost HP. There's also random events, like matching up cards or attempting to grab a Relic with a certain percentage of success while taking damage and so on. There's even multiple characters, each with a rather different way of playing. On top of that, each run will give you experience to unlock more and so that game has a huge amount of replay value. Now that they've left Early Access and the game is technically complete, they still have more planned. They didn't spoil any of what it is though, so we will just have to wait. The only downside, is that for some the fullscreen option is completely broken on Linux. On my desktop, I only ever get it in a window no matter what I pick. However, on my notebook it's fine and fullscreen works as expected so your mileage may vary there (it also performs perfectly on an old Intel notebook!). Slay the Spire is a game that has very quickly positioned itself towards the top of my most played games of all time, it's just that good. You can grab it from Humble Store and Steam. They have said before they plan to add another character. Looking forward to that. Well, that's Game of the Year 2019 decided. scaine Well, that's Game of the Year 2019 decided. I know right, I'm not sure much can top it! Honestly, this is the most enjoyable game I have ever played. I think it's my favorite game ever.